In just 5 years since Buffer got its start in 2010, it has become the go-to social media tool for marketers. An easy-to-use social media scheduling and management platform, it helps marketers save time by scheduling and publishing content across multiple social media accounts at once. Buffer also offers tools to help with content curation and provides rich analytics that enable marketers and agencies to track engagement and identify their most successful posts. As of this writing (January 2016), Buffer has more than 3 million registered users. Buffer is also well-known for its radically transparent culture. The company’s blog has a section specifically dedicated to all the information they’ve shared, including their employees’ salaries. It’s only natural Buffer wanted to extend this transparency to their product development process. In Buffer’s early days, founder and CEO Joel Gascoigne personally reached out to new customers to learn more about them and their needs. As it grew, the company’s dedication to maintaining personal relationships with customers carried on. The team wanted to find a way for their growing community to easily suggest and vote for improvements to the platform. Finding a solution that was both scalable and transparent was very important — they found UserVoice to be a great fit. According to Buffer Customer Development and UX Researcher, Tom Dunn, UserVoice provides customers with many channels for sharing feedback and feature requests, and is “the first step to narrow down [feature] options.” The team uses UserVoice to collect qualitative feedback that not only provides validation but also more understanding around each request. “It’s amazing to see customer comments and votes on feature ideas. It adds another layer of context and helps us to make the biggest impact with what we have,” says Tom. He says that it’s this sort of “mutual collaboration” between customers and Buffer that helps them develop tools that their users really need. One standout example of this kind of collaboration was in 2015, when Buffer’s Happiness Team received several support tickets asking why Buffer didn’t have video support for Twitter. Tom’s team leveraged UserVoice to validate the idea, noting that many other customers had requested the same feature. Adding another layer of validation, they worked with their data engineers to see how many customers were uploading YouTube links in their tool. Tom then reached out to one vocal, savvy customer to brainstorm design ideas, even sharing and discussing early feature concepts. “Through on-going collaboration, our customers saw initial requests turn into a powerful feature and it felt amazing to essentially partner up with customers to build something that solves their problems,” says Tom. 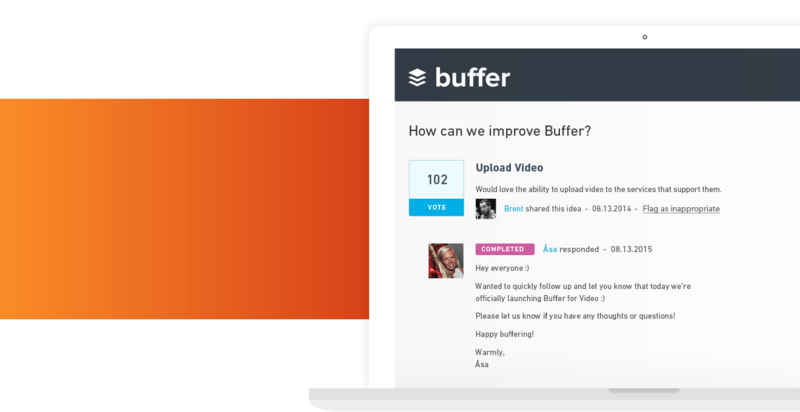 UserVoice was a fundamental component of Buffer’s customer collaboration and validation process, helping them to arrive at a product solution that satisfied their customers’ video needs. UserVoice gives Buffer the confidence that they are making the right decisions and the knowledge that they are solving actual problems for their customers. To support their growth and long term success, Buffer will continue to do what’s worked well for them since day one: Maintaining a sharp focus on customer happiness by listening carefully to customer input when building new features.